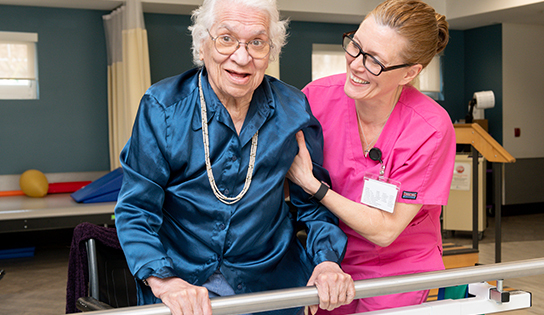 Ms. Chalk was admitted to The Phoenix Rehabilitation & Nursing Center on May 12, 2017 from Brooklyn Hospital Center for rehabilitation after a knee replacement procedure. When Ms. Chalk first arrived, she shared deep dismay with her need for admitting to an in-patient rehabilitation center and the inability to immediately return home. She went on to share a little about herself, describing her next step to move to Texas with her family. Ms. Chalk’s physician recommended for her to undergo a knee replacement prior to moving such a long distance. Once extremely active, independent and mobile, she now felt helpless. Ms. Chalk was introduced to the wide-array of services and amenities offered at The Phoenix, calming her peace of mind and reassuring her that she would receive unprecedented levels of care through a patient-centered and holistic approach. She was also introduced to the members of the team overseeing her care including that of her nurse manager, dietitian, social worker and her rehabilitation therapist. Ms. Chalk was reaffirmed that there were multiple professionals at The Phoenix who would assist her in her journey of healing and recovery. With the understanding that her intent was to return to independence as soon as possible so that she could move to Texas, we scheduled her physical and occupational therapy five days a week to support a vast and quick recovery. Her goal was to achieve independent functionality in two weeks. The journey of recovery was presented as an all-encompassed regiment that would take a great deal of endurance and will to fulfil. She worked with her therapist very closely with the incredible improvement of walking with the aid of a walker in just four days! As a diabetic, Ms. Chalk was also supported with a healthy and nutritious therapeutic diet. She shared that she loved the selection provided at The Phoenix. Once she began to feel stronger, she started to participate in most of the activities provided by the Recreation Department. With the help and support from the entire interdisciplinary team, Ms. Chalk was discharged home with a walker on May 25th, 2017! She was so happy and thrilled with the level of care and compassion she received while at The Phoenix. We wish you nothing but the best as your new journey begins in Texas, Ms. Chalk! This entry was posted in Case Studies. Bookmark the permalink.